It’s been a funny day. What started with deep-sea fog hanging over the village and loosing me my dog whilst out on a walk, ended with glorious sunshine and a heat normally associated with April or May. With the outbreak of spring weather I was inspired to get cooking. Today’s recipe selection was fairly eclectic including a fruity chilli courtesy of Thommi Miers, Madeira cake and homemade bread, but most importantly focaccia. This recipe will give you less of the cake-style focaccia you buy in the supermarket and more of a doughy bread studded with rosemary and steeped in fruity extra virgin olive oil. To make your basic dough follow this recipe, feel free to embellish your focaccia with any topping or additions you like. Sundried tomatoes, feta cheese, olives and pine nuts are all fantastic individually or combined. My focaccia is your starting point with just rosemary sprigs pushed deep into the dough and a sprinkle of sea salt. Preheat your oven to 180C/Gas mark 4. 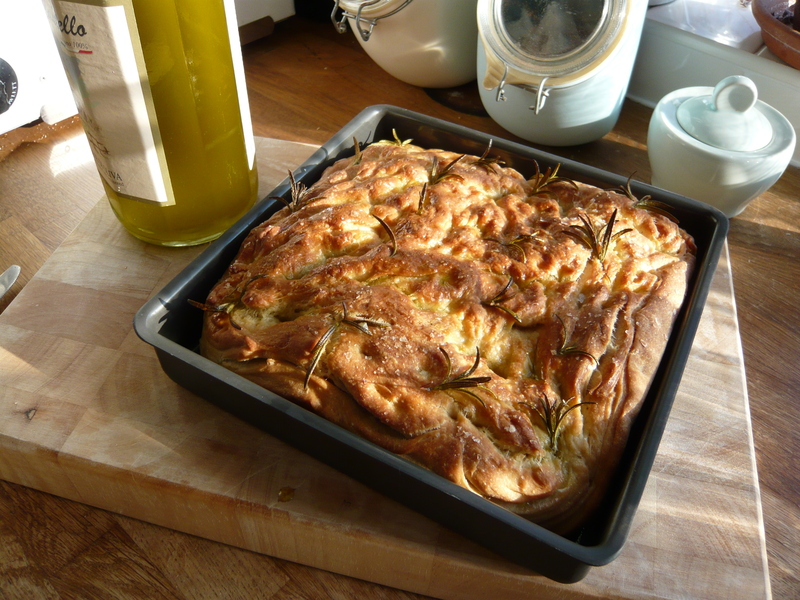 Grease a 20cm square brownie tin or a baking sheet if you prefer a round focaccia. Place all your dry ingredients together in a large bowl, you can make your dough by hand or using a mixer with a dough hook. Slowly add your warm water to the centre gradually bringing your dry ingredients together. Keep combining until you have a sticky dough mixture. This is where some elbow grease is required. Take your dough out of the bowl and on to a lightly floured surface. (Don’t introduce too much extra flour though) keep pushing, turning and kneading the dough until it becomes springy, smooth and elastic. If you use a mixer this will be pretty easy but don’t get smug at some point you will need to get your hands dirty! Shape the dough into round ball and place in bowl. Cover with clingfilm and leave in a warm place to prove. This will take about an hour. Once your dough has puffed up nicely get your baking tray or tin ready, grease lightly with oil then place your dough on top. Push and spread your dough out across the tray, stretching it out. When you are happy with the shape pour several glugs of oil onto the top of the dough. Push the oil into the bread with your fingers and then stud the top of the focaccia with your chosen topping or rosemary sprigs. Bake in the centre of your preheated oven for about 30 mins keep an eye on the top so it doesn’t burn. Don’t worry if your focaccia looks a bit knobbly that’s part of the charm. I add a drizzle of olive oil and a sprinkle of sea salt at the end to boost the finished flavour.